There are various mobile applications developed to help people enjoy their mobile devices in a better way, such as phone managers, messaging apps, mirroring apps and much more. Regarding mirroring apps, they are often-used applications these days because most people want to watch movies on a bigger screen like a computer or share files or gameplay with others from their phone. It is common to see people mirroring Android or iOS devices on their computer, or even mirroring Android to iOS devices and vice versa. However, there may be an occasion where you want to share videos, pictures, or other files stored on your Android phone to another Android device. You may be wondering how to mirror Android to Android. Here, we introduce you practical tools to help you achieve this. ApowerMirror is a professional screen mirroring application. Recently, it has released a new version that adds certain functions of mirroring iOS to Android device and casting Android to iOS or another Android device as well, which will be a huge stur in the mirroring field. 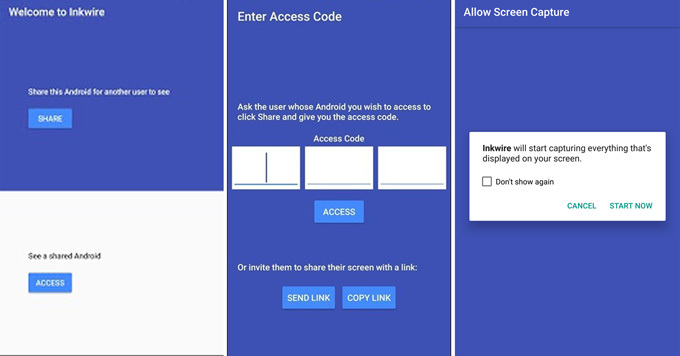 With this app, you don’t need to worry about Android to Android screen share. Just follow the guidance below to achieve this. 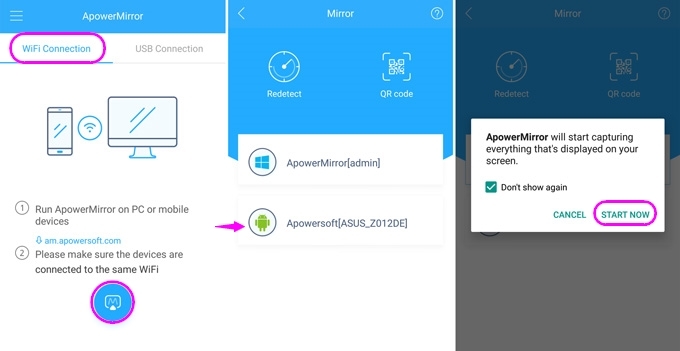 Download ApowerMirror on both your Android devices from the Google Play Store. Connect both of your devices to the same WiFi network, and then launch the app on both of your devices. Go to “WiFi Connection”, tap the blue mirror icon on the bottom part of the screen, and then it will search for devices automatically. Among the found devices, choose the target Android device that you want to mirror to. Then click on “START NOW” and your Android screen will be displayed on another Android device. Once the connection is done, you can freely share your Android screen with another Android device. Here is a video to guide you. Teamviewer is a widely used application that allows remote control, desktop sharing, and file transfer. Besides, it makes screen mirroring between mobile devices possible. Follow the simple steps below to mirror Android to Android. Download and install Teamviewer for Remote Control and Team Viewer Quick Support on both of your Android devices from the Google Play Store. 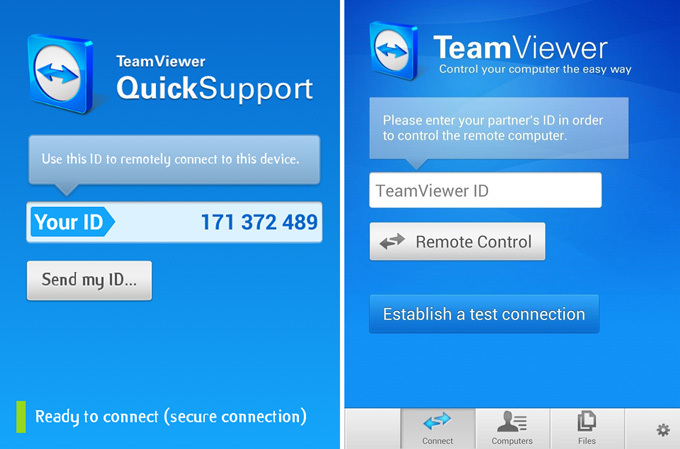 Open Teamviewer for Remote Control on your Android device and open Teamviewer Quick Support on the other Android device. For Quick Support, you can find an ID of the device once the application is launched. For Remote Control, enter the ID of the Quick Support device in order to establish the connection. Click on “Allow” and then on “Start Now” when a window pops up asking for remote support for your Android device. Once done, your Android device will then be mirrored to another Android device. Another tool that allows screen mirroring from Android to Android is Inkwire Screen Share + Assist. 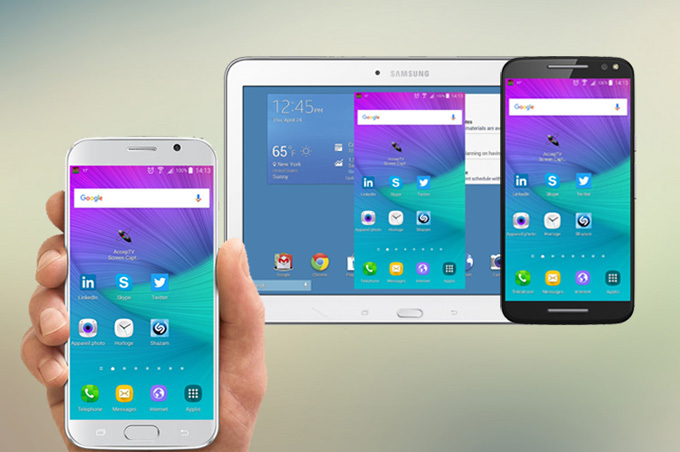 It’s easy to share the screen of one Android phone to another Android device with this app. It requires Android version 5.0 and up in order to be successfully installed on your phone. Proceed to see how to use this app to facilitate Android to Android screen share. Download Inkwire Screen Share + Assist onto both of your Android devices from the Google Play Store. Once the application has been installed, launch it simultaneously on both of your Android devices. If you want to share the screen of your Android device, tap on the “Share” button for the other device to see. Afterwards, you will be directed to a window where your access code is created. Simply tap on the “Access” button and enter the 12-digit access code to see a shared screen of an Android device. Then your Android will be connected to the other Android device. Given the fact that the guidance about Android to Android screen mirroring applications stated above are helpful and relevant to you, now you have enough knowledge about how to share your Android screen to another Android device with them. The three applications are useful and easy to operate, you can make a choice according to your own needs. Rating: 4.1 / 5 (based on 37 ratings) Thanks for your rating! Teamviewer works best but I'm looking for one that allows it over WiFi.